Reading back over the many excellent (if I do say so myself) posts here at the ENSO blog, there have been several re-occurring themes—the biggest of which is that ENSO is not just an ocean phenomena but an ocean-atmospheric interaction. ENSO is no one-man act. If the ocean is Abbott, then the atmosphere is Costello; the ocean…Laverne, the atmosphere…Shirley; the ocean…Kanye, the atmosphere…Kim. And just like there would be no “Kimye” without Kanye West and Kim Kardashian, there is no ENSO event without both an atmospheric and oceanic response. We have previously touched on both aspects of this with a post on the importance of a sea surface temperature (SST) gradient in the equatorial tropical Pacific Ocean (and the lack of gradient may be currently hindering the development of El Niño) as well as a post on the atmospheric response, the SO part of ENSO, where Emily Becker described the Southern Oscillation, especially the lack of typical response in that Southern Oscillation during June 2014. 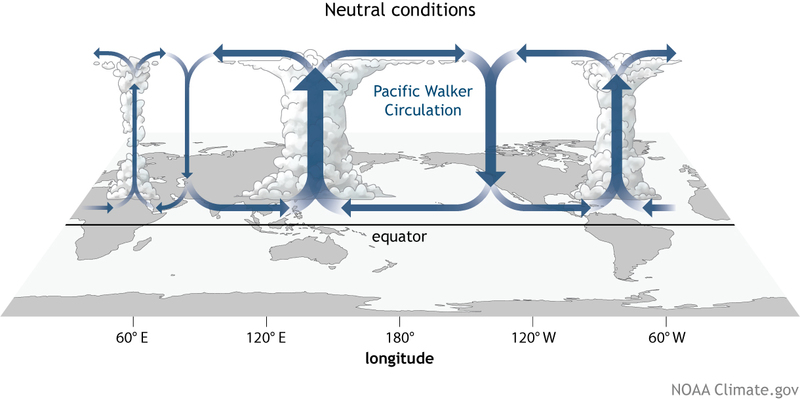 The focus of Emily’s post was on the Pacific Ocean atmospheric circulation, which we also call the Pacific “overturning cell” of an atmospheric “loop” called the Walker Circulation. The lower part of the loop flows east to west across much of the tropics near the surface; the upper part flows west to east at higher altitudes. Rising air in the west and sinking air in the east connect the flow in one big, continuous loop. The post EN…SO? describes how El Niño can affect this Pacific Ocean “overturning cell,” but unlike the popular saying in that desert southwest tourist town, what happens in the Pacific, does not just stay in the Pacific. ENSO can affect this atmospheric circulation, the Walker Circulation, over the entire tropics, impacting rainfall near the equator across multiple continents from Africa to Asia to South America! SO (pun intended) what does the entire Walker Circulation look like normally and how is it maintained? 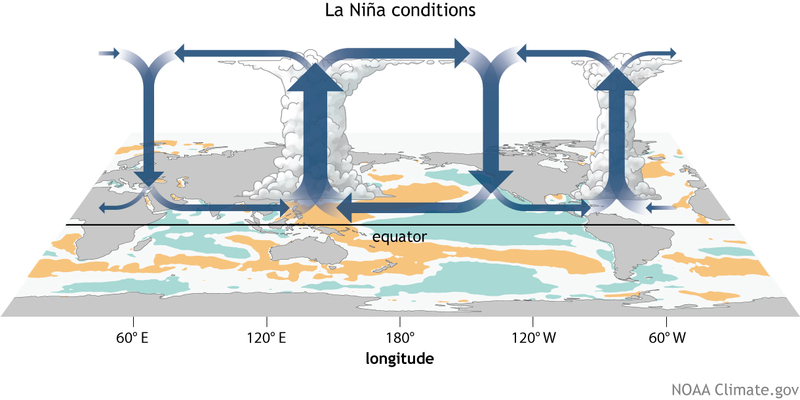 Figure 1 shows a simplified version of what the airflow over the equator looks like during the northern hemisphere winter, when ENSO events—El Niño and La Niña—are strongest. During neutral ENSO conditions, upward branches of the Walker Circulation rise strongly across the Maritime Continent and more weakly over eastern Africa and northern South America. These rising branches coincide with bull’s-eyes of precipitation during December through February. In contrast, downward branches of dry, stable air sink strongly over the eastern Pacific Ocean and more weakly over the Arabian Sea. What creates such a broad, large-scale circulation along the equator? Well, we already sorta went over that here, when talking about the importance of a sea surface temperature gradient. Thanks to Earth’s rotation on its axis, trade winds at the equator blow relentlessly from east to west, pushing sea water towards the west side of most ocean basins. The ocean water warms the entire way. The end result is relatively warmer surface water in the west and cooler surface waters in the east. Above this large pool of warm water (known to Earth scientists as the Pacific Warm Pool), air rises; above the cooler water in the east, air dries and settles near the surface. More widespread storminess and rising air motion are associated with a larger warm pool. Temperature contrasts between land and ocean also amplify the circulation (1). From Figure 1, we can see that the strongest upward branch of the Walker Circulation is located over the Maritime Continent, north of Australia. Weaker upward branches occur over less discernible warm pools, like the western Indian Ocean. The relative strength of the rising branch over South America is between those two extremes. The Walker Circulation is basically a thermally (fancy word for temperature) direct circulation that relies on temperature differences to drive the rising and sinking branches. 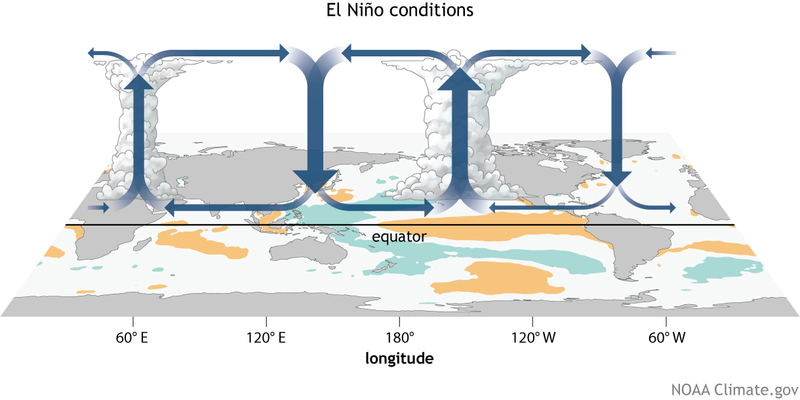 During ENSO events like El Niño and La Niña, this circulation gets either pushed or pulled around (El Niño) or sent into overdrive (La Niña) across the Pacific. We’ve discussed how during El Niño, this warm pool of water usually in the western Pacific Ocean begins to slosh to the east. As this warm pool moves east, the rising branch of the Pacific cell of the Walker Circulation follows, and boy does the rest of the Walker Circulation get shifted around (Figure 2). Instead of strong rising motion over the Maritime Continent, upward flow weakens, and anomalous sinking motion occurs. The usual rising, moist air over South America is replaced by another anomalous sinking branch. The reversal of the circulation generally means that less rainfall than average dominates in these two areas during El Niño. In contrast, increased rising motion enhances rainfall over the central Pacific Ocean and even parts of equatorial eastern Africa. Meanwhile during La Niña events (Figure 3), when waters in the western Pacific are even warmer than normal and waters in the eastern Pacific are even colder, it is like someone turned the normal Walker Circulation “up to 11”. Warm, moist air rises even more over the Maritime Continent and South America leading to above-average rainfall. In the eastern Pacific, where colder than average waters exist, an enhanced downward branch of the Walker Circulation helps to further reduce the region’s already small rainfall totals. Figure 3: Generalized Walker Circulation (December-February) anomaly during La Niña events, overlaid on map of average sea surface temperature anomalies. Anomalous ocean cooling (blue-green) in the central and eastern Pacific Ocean and warming over the western Pacific Ocean enhance the rising branch of the Walker circulation over the Maritime Continent and the sinking branch over the eastern Pacific Ocean. Enhanced rising motion is also observed over northern South America, while anomalous sinking motion is found over eastern Africa. NOAA Climate.gov drawing by Fiona Martin. So in addition to ENSO impacts outside the tropics, ENSO events literally change the overturning circulation across the entire equatorial region. Of course, these patterns describe idealized or typical cases. As of early July, we were still waiting for the atmosphere to begin to reflect characteristics similar to Figure 2, if it does at all. If the atmosphere gets in gear, plenty of places could see changes in their usual rainfall patterns. But until then, we wait and see, trying to figure out what Mother Nature has up her sleeve. (1) Rising and sinking branches of the Walker Circulation generally occur over land as opposed to the ocean. This is due to a variety of other forcing mechanisms such as land-sea temperature contrasts where land areas warm and cool to a larger degree than the oceans nearby which is one reason why rising and sinking air is focused over land.